Ruffian was an American champion thoroughbred racehorse, considered to be among the greatest U.S. racehorses of all time. Her story was told in 2007 film Ruffian. A dark bay, almost coal black filly, nearly 17 hands, Ruffian was foaled at Claiborne Farm, near Paris, Kentucky. She was bred by Stuart S. Janney, Jr. and Barbara Phipps Janney, owners of Locust Hill Farm in Glyndon, Maryland. Ruffian was sired by the Phipps family's Bold Ruler stallion, Reviewer, and out of the Native Dancer mare Shenanigans. As a yearling and 2-year old, Ruffian was trained by Frank Y. Whiteley, Jr.
She earned the nickname "Queen of the Fillies" after being voted the Eclipse Award for Outstanding Two-Year-Old Filly in 1974 and winning the Filly Triple Crown (now called the Triple Tiara) in 1975. Lucien Laurin, Secretariat's trainer, said this quote to the press "As God as my witness, she may even be better than Secretariat." Ruffian was undefeated in her first ten races, covering distances from 5.5 furlongs (1.1 km) to 1.5 miles (2.4 km) with an average winning margin of 8 1/3 lengths. She won her maiden race in record time and by 15 lengths. She was on lead at every point of call in every race she ever ran. She set a new stakes record in each of the eight stakes races which she won. She had also equaled two track records. If she didn't set track or stakes record, she equaled them. Ruffian had won the Sorority Stakes (setting a new stakes record) on a freshly popped splint, which, although not a serious injury, but painful, was enough to take the edge off a horse. Ruffian's eleventh race was run at Belmont Park on July 6, 1975. It was a match race between Ruffian and that year's Kentucky Derby winner, Foolish Pleasure. The two horses shared the same jockey, Jacinto Vasquez. Vasquez chose to ride Ruffian in the match race, believing her to be the better of the two horses; rode Foolish Pleasure. The "equine battle of the sexes" was heavily anticipated and attended by more than 50,000 spectators, with an estimated television audience of 18 million. As she left the starting gate she hit her shoulder hard, straightened herself, and they were running. The first quarter-mile (402 m) was run in a blazing 22 1/5 seconds, with Ruffian ahead by a nose. Little more than 1 furlong (201 m) later, Ruffian was in front by half a length when both sesamoid bones in her right foreleg snapped. Vasquez tried to pull her up, but the filly wouldn't stop. "She went on running, pulverizing her sesamoids, ripping the skin of her fetlock as the bones burst through, driving the open wound into the sting sand of the Belmont track, tearing her ligaments, until her hoof was flopping uselessly, bent up like the tip of a ski." She was immediately attended to by a team of four veterinarians and an orthopedic surgeon, and underwent an emergency operation lasting three hours. Tragically, when the anesthesia wore off after the surgery, she thrashed about wildly on the floor of a padded recovery stall as if still running in the race. Despite the efforts of numerous attendants, she began spinning in circles on the floor. As she flailed about with her legs, she repeatedly knocked the heavy plaster cast against her own elbow until the elbow, too, was smashed to bits. The cast slipped, and as it became dislodged it ripped open her foreleg all over again, undoing the surgery. She also broke the rest of her legs front and back. The medical team, knowing that she would probably not survive more extensive surgery for the repair of her leg and elbow, euthanized her shortly afterwards. Ruffian posthumously earned the 1975 Eclipse Award for Outstanding Three-Year-Old Filly. In 1976, she was inducted into the National Museum of Racing and Hall of Fame. The Blood-Horse ranked Ruffian 35th in its list of the top 100 U.S. thoroughbred champions of the 20th Century; she is the highest rated filly (or a mare) on the list. By virtue of that ranking lays claim to the title "Filly of the Century." She was also only female horse on both lists (best male, best female).Sports Illustrated included her as the only non-human on their list of the top 100 female athletes of the century, ranking her 53rd. Ruffian's breakdown and death led to a public outcry for more humane treatment of racehorses. As it is natural for horses to thrash and kick when coming out of anesthesia, a "recovery pool" was developed so that they awake suspended in warm water and don't re-injure themselves. Medications such as Lasix for bleeding and corticosteroids for inflammation and pain management, came into common use. While helping the horses in the short term, the increased use of medications at the track had a downside, as many more horses were raced while injured. It was argued within the sport that thoroughbreds became more delicate as a result of inbreeding, starting racing too young, and racing while injured; racehorses today run only half as many starts before retirement as did their counterparts 50 years ago. 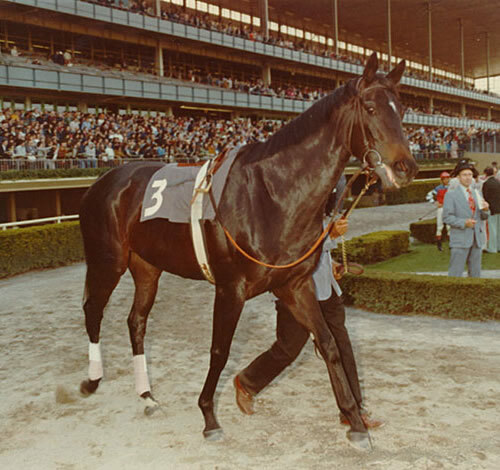 Some of this effect is likely also due to breeding practices that select for horses likely to have short, brilliant careers—like Ruffian's—instead of the traditional racing career which might have lasted several years. Indeed, Ruffian's bloodline may be considered at least partly to blame for her broken leg; her sire, Reviewer, suffered three breakdowns. After his fourth and last breakdown, obtained while in his padock, he had to be euthanized June 21, 1977 post-op in a similar fashion to his famous daughter. Reviewer's sire Bold Ruler was legendary for his breakdowns and painful death after standing at stud (although Bold Ruler's cause of death was a recurring malignant tumor in his nasal passages). Shenanigans, Ruffian's dam, broke two legs during her life and was euthenized following intestinal surgery May 21, 1977. Ruffian's damsire was Native Dancer who is often considered to be the purveyer of "soft boned" genetics. 34 years after she died, Ruffian was honored again through the Medical Center at Belmont Park named after her. The Ruffian Equine Medical Center was opened in May 26. 2009. It cost $18 million and is located outside Gate 8 of Belmont Park. Inside the facility, specialists work to solve problems before they become major issues, such as a colt showing lameness that can be diagnosed and cured before he makes the track, perhaps providing such an animal to do his job and even have a good life beyond the track.